Treatment of a primary or secondary alcohol with phosphorus tribromides (PBr3) results in alkyl bromides. Alkyl bromides can be made from alcohols through inorganic esters which are capable of changing the hydroxy function into a good leaving group under milder conditions. The treatment of a primary and secondary alcohol can be achieved with phosphorus tribromide PBr3. 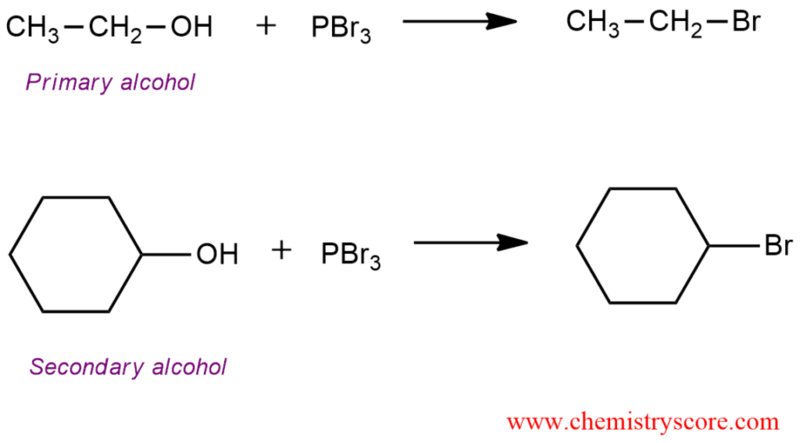 The mechanism for this reaction also consists of two parts. The first is a conversation of a bad leaving group into a better leaving group, and second is nucleophilic attack by halide ion via an SN2 mechanism. If this reaction occurs in the center of chirality, the inversion of the configuration should be expected. STEP 1. The OH group converted into a good leaving group and also generates bromide ion which is nucleophile in the next step. STEP 2. Nucleophilic attack of bromide ion and loss of the leaving group. This reaction can be continued with OHPBr2 and successively react with two molecules of alcohol, converting them into alkyl halides as well.